"Nosema ceranae certainly is a stressor, but it doesn’t seem to be the smoking gun that we were looking for." 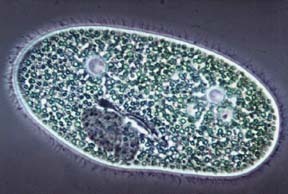 Above: Single-cell protozoan by Science Source. 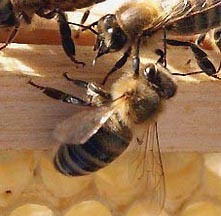 Below: Honey bees atop hive board. Another protozoan, Nosema ceranae, has recently been linked to honey bee die-offs in Spain, France, other European countries and the United States. But Colony Collapse Disorder scientists say it's not the final answer to CCD. Honey bee image © 2007 by Matt Cardy/Getty.